Ultra-high frequency (UHF) radio-frequency identification (RFID) technology is being adopted by a variety of applications such as inventory control tracking, race timing, attendee tracking, access control, and more. A significant challenge for RF/microwave designers is performance degradation of UHF RFIDs due to RF interference. 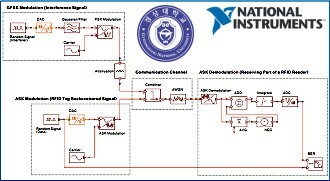 Professor Wang-Sang Lee and his team at Gyeongsang National University in Korea used NI AWR Design Environment, specifically Visual System Simulator™ (VSS) system design software, to consider the electromagnetic interference (EMI) effects of an RFID signal and to analyze the impact of RF interference in a passive UHF RFID system. "VSS is easy to use and provides detailed descriptions of each element, which helped us to quickly and easily analyze the RFID system," said Professor Lee. "The many useful VSS examples related to recent RF system simulations available through the knowledgebase were very helpful, as was the responsive technical support." The complete success story can be found at awrcorp.com/customer-stories/gyeongsang-national-university-gnu. The NI AWR Design Environment software portfolio includes RF/microwave electronic design automation (EDA) tools such as Visual System Simulator™ for system design, Microwave Office/Analog Office for microwave/RF circuit design, and AXIEM and Analyst™ for electromagnetic analysis. NI AWR software tools help design engineers to dramatically reduce development time and cost for components, circuits, systems and subsystems employed in wireless, high-speed wired, broadband, aerospace and defense, and electro-optical applications. Readers can learn more at ni.com/awr.